I walk alongside the fence at the edge of the Moor. It's mid-April, the week before Easter. Lapwings tumble and whoop above the fields to my right. There seem to be more of them this year, which has to be a good thing. Lapwings are, without doubt, one of my top-ten birds. 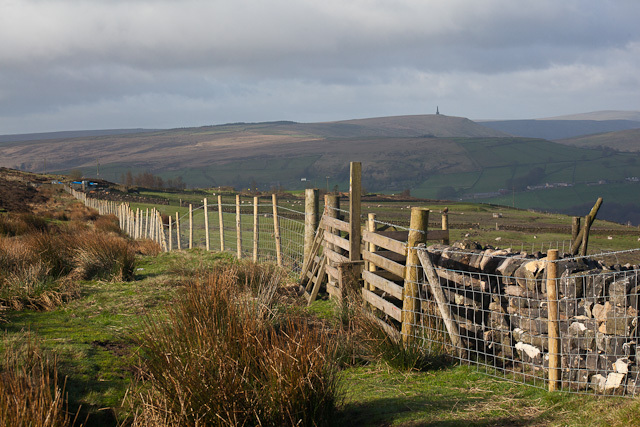 Fence at the edge of the Moor. Despite the strong, cold breeze, it has finally begun to feel more like spring. I saw my first swallows and wheatears of the year the week before last. The skylarks and meadow pipits were in full song up at the trig point twenty minutes ago. The grouse are starting to sound more boisterous—not that they don't always sound boisterous. On the slope above me, the wheezing pipe of a golden plover calls from somewhere in the heather. Rooks wheel and bob in the up-draft above the edge. One of them has something white in its beak. An early egg, perhaps. The other rooks begin mobbing it. It heads off across the fields, a couple of its more persistent colleagues in hot pursuit. The fence becomes a wall. 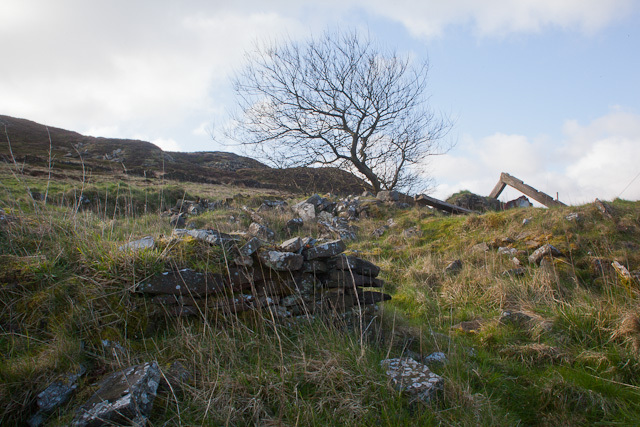 I navigate a boggy section of the path and, climbing the stile at the end of the wall, enter the enclosed corner of the Moor known as Johnny House. They used to quarry up here. Johnny House, whatever it was, is just a pile of stones and a few old beams now. It must have fallen into disrepair many years ago: a sizeable tree now grows out of the rubble. I pass the ruin and head up the slope. I'm on a mission. I've come this way, as I do each spring, to check if an old friend has managed to survive another winter. At some point in the unrecorded past, two trees grew side-by-side just above Johnny House. I presume both were blown down, perhaps in the same gale. One tree is very much dead, its trunk snapped right through a couple of inches above ground level. The other tree, the nearly-dead tree, has somehow managed to cling on. Or so it had the last time I checked. 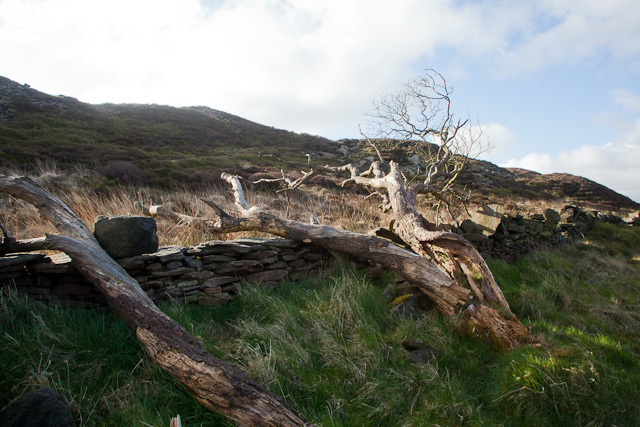 Both trees lie, as they have always lain since I first came up here twenty years ago, sprawled inelegantly across what is left of the drystone wall bounding the enclosure. The tree on the left, the dead tree, has lost all of its branches, most of its bark, and has snapped into several large fragments. If anything, the nearly-dead tree looks to be in even worse shape, having been rent in half, top to bottom. Its denuded left half resembles the dead tree, and is every bit as dead. Its right half has come off slightly better, having managed to retain most of its bark, and a single side-branch bearing actual twigs. It is these twigs that I have come to inspect. But first, a brew. I sit on the wall between the two recumbent trees and unscrew the lid of my flask. For years, I assumed the nearly-dead tree was an elder. I'm not very good at trees, but decided it had an elderish look to it, going by its general size, and deeply rutted bark. But I've recently come to the conclusion that the nearly-dead tree and its late companion are more likely to be goat willows. This change of mind was prompted by my more confident identification of another goat willow on my way down from the Moor a few summers ago. The tree in question's leaves were covered in tiny emerald beetles. It was trying to identify these beetles that made me look more closely at the tree they had congregated on. It was then that I noticed the tree's similarity to the nearly-dead tree. After much clueless internet searching, I eventually concluded that the beetles were none other than Plagiodera versicolora, a type of leaf-beetle which feeds on willow. Which led to my concluding that I was looking at a goat willow, not an elder. Which made me suspect that I might have misidentified the nearly-dead tree as well. Like I said, I'm not very good at trees. But at least I'm trying. I admire the trunk of the nearly-dead tree as I drink my tea. It was the trunk that first attracted my attention. 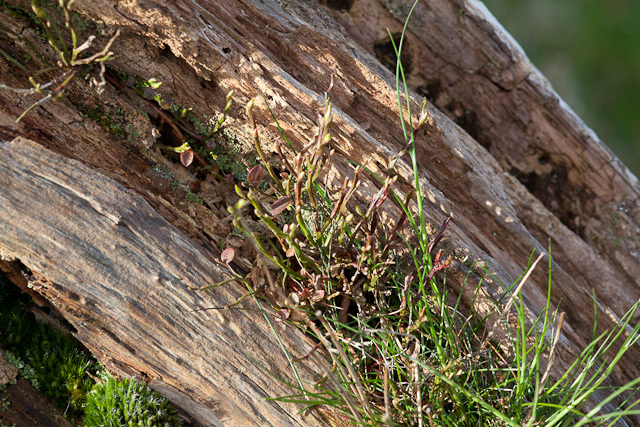 It contains several crevices and hollows, niches in which other plants such as moss, bilberry and tormentil seem to thrive. Life is good at finding new ways of making a living. My new friend the botanist Johnny Turner informs me that plants which live on other plants in this way are known as epiphytes: one of those words you never thought there would be a need for, but, once you know it, seems extremely handy. I've been trying to slip it into everyday conversation ever since. Well, not so much slip as crowbar. From the photos I've sent him of the nearly-dead tree, Johnny provisionally concurs with my goat willow hypothesis, although he says he'll need to see it in person before he can say for sure. So, I've arranged to come for a walk up here with him in a couple of weeks' time. Bilberry growing on the nearly-dead tree. My cup of tea finished, I take a deep breath and clamber over the wall. The moment of truth has arrived. I twist my way between the nearly-dead tree's prostrate limbs to inspect its sole remaining branch. I'll be really pissed off if it has finally given up the ghost. But something tells me the nearly-dead tree will still be going long after I'm dead and buried. 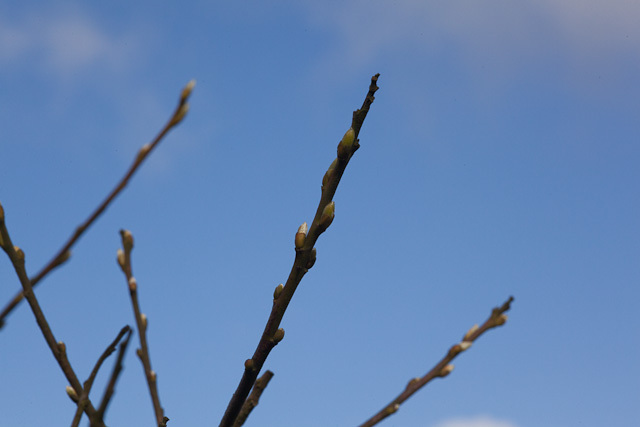 Wonderful news, it's just as I hoped: the twigs on the nearly-dead tree's last branch are covered in half-opened leaf-buds. The tree has survived yet another winter. It is still only nearly dead. Renewed signs of life on the nearly-dead tree. I'm more delighted than I would care to admit. The hopeless fight against entropy continues: the nearly-dead tree might be down, but it's not out. Not yet. Respect where it's due: it might be an unseemly wreck—a mere shade of its former self—but the nearly-dead tree carries on as best it can, fulfilling its sole purpose in life: being a tree. 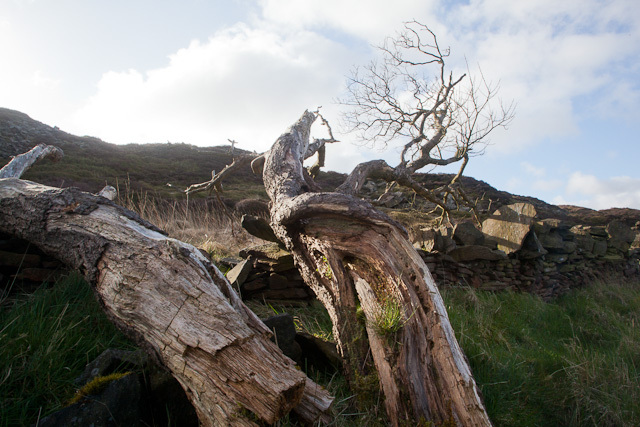 Postscript, May 2014: Since writing this article, I have taken Johnny Turner to see the nearly-dead tree, which Johnny confirmed is indeed a goat willow.